If you ask me what money means, I’d say it’s used as a means of exchange, among other things.But J Paul Getty, one of the world’s richest men, said: If you can count it, you don’t have enough of it. Money is the harsh reality of life. Some love for it, some die for it, some use it well, some waste it, most fight for it, but most others desire it. After having earned so much, I have realised one thing — that money cannot be an end to itself.Money has got five crore good things, just one really bad thing: you can’t take it with you.Take me as an example. At the age of 50, for a man who smokes 25 cigarettes a day and drinks six pegs of whiskey, doesn’t exercise and eats like a pig, there is limited life.For the last 25 years, I have fought day and night to earn this money, but what is it doing for me?Or rather, what am I going to do for it?What is this money going to mean for my children beyond a certain level? We all know that money surpasses generations, countries, cultures and religion.There is this famous saying in Hindi: ‘Zar zameen aur jaydaat, har jhagde ka jad hai’ (‘Money is the root cause of all evil’).But I think that every rose comes with a thorn.Money is a cause of dispute, evil and causes a lot of problems but in the end, it is something one should desire.Money means wealth, and wealth means power. A lot of times, when I think about money, I realise that I have far less wealth than people think I have, but far more than what I actually need. Wealth also has a purpose in life. If you were to ask me, I have come to one conclusion that I stand by — that as long as I use the right means, I have the legitimate right and the ambition to desire the greatest wealth of the world. Money also causes a lot of envy and misdeeds which I would like you to avoid.I belonged to a middle class family. When I was young, I had very rich friends. But my father taught me: Always aspire, never envy.So, if you meet someone who is rich or powerful, always aspire (to be like them), but never envy. Because envy causes anger and disputes. What else can I say about money?I can say that it attracts a lot of young women, it also attracts women of all ages, but they are not necessarily of the desirable kind. I am telling this to you from my experience. I would also like to tell you about my experiences with my father and what he had to tell me about money.All his life, he was only concerned about one thing: what I should be doing with my wealth. He was a middle class guy and I lived with him for as long as he was alive. He never lived in my house, I lived in his. My father was never concerned about how much wealth I had, his only concern was how much charity I did.When I became rich and he came to know of it for the first time, he called me up and said, “Naya paisa hai, aur naye naye paise ki garmi bhi bahut hoti hai” (“It’s new money, and new money is accompanied by a lot of heat”). He told me that increasing one’s expenses was very easy, but reducing them was very difficult. My father taught me the importance of dena (giving) and daan (donating). He said that if anyone knocked on my door and asked for money, I must give him Rs 100 or Rs 1 lakh, depending on what I felt like, but never let him/her leave empty-handed. Always donate, he said.When my father came to know that I was among the Forbes list of billionaires, he said, “I am very happy to know that you are on the list. But aren’t you shameful? You have billions of dollars of money, but you can’t give away a few dollars in charity? Go and die in a pail of water,” he told me. A lot of people ask me: How does it feel to be rich in a poor country?Let me correct you, I don’t think India is a poor country. We are very rich in culture, food, resources, thought and also in our film industry. So, I don’t feel guilty at all.Renowned British beaureaucrat Winston Churchill once said: Equality of mankind is a myth, equality of opportunity is a possibility.So, as a rich man, I would like to ensure that all Indians have equal opportunities.Looking back, I feel I would not have been so rich if India had not been a prosperous country. When I started my career in the stock market in 1985, the index was 112 (points). Today the index is 20,000, which itself is reflective of the growth and prosperity of our country. If this prosperity had not come to our country, I would never have been as rich as I am today.I also feel very happy and lucky that I worked in the post liberalisation era. Today, I feel India is entering its second path of liberalisation. It is this liberalisation that has allowed people to generate wealth. You get to see so many young billionaires in India today.And people from other parts of the world are unhappy at the fact that India has more entrepreneurs and billionaires than China. It only reflects that India promotes private enterprises and encourages capitalism better than China. I also strongly feel that the only way we can get rid of poverty is by creating growth. At the same time, let us not worry about how the cake is being divided. Let us instead worry how large the cake is going to be. The moment the cake gets large, it gets divided better.German socialist (Karl) Marx was a true visionary, especially when he said: You will achieve capitalism, through the means of communism.Do you know which countries today have the highest per capita income, the highest rate of taxes and the highest rate of social welfare? It is the Scandinavian countries. Also, 70 per cent of babies in these countries are born out of wedlock. This only means that these countries have achieved the highest level of socialism and social welfare through the means of capitalism.I would like to appeal and add that us Indians should work to make a much larger cake than we currently have. Will I ever stop working if I have ten times the wealth I currently have? The answer is, I won’t!Let me tell you I am still a middle-class man. I value every paisa I spend.When you pursue a woman, the hunt is always better than the kill. It’s the same about money. The enjoyment in earning it is far better than having it. What has money done for me?It has allowed me to travel in a Mercedes instead of a Maruti car, I live in a 5,000 sq foot flat instead of a 1,000 sq feet flat. In place of smoking a Four Square cigarette, I now smoke India Kings, I drink Blue Label whiskey instead of Diplomat. Besides that, money hasn’t made much difference to my life. The giver of wealth is God. 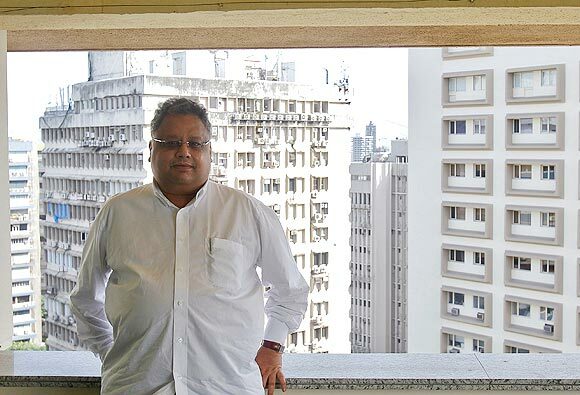 Rakesh Jhunjhunwala is what he is today because he has the grace of God and the blessings of elders. Never forget that in your life.All the adjectives in life — beauty, power, hunger, wealth, happiness etc — are all temporary and are each given to us by Him. So when he gives us so much wealth, he also entrusts some duty on us. That this money be used for social purposes. I don’t think giving is giving, I think that giving is duty.Today I donate 25 per cent of my income to charity. In 2020, either a billion dollars or 25 per cent of my wealth, whichever is lesser, I am going to donate as charity. Money has a purpose and a responsibility. Making the first million is always difficult, the second is not so difficult, the third is even easier.What you do to money is not very important, but what money does to you is very very important. Let it not change you as a human being. Let it not change your attitude towards your friends, family and the people who you’ve grown up with.The things money can buy are certainly important, but the things money can’t buy are the most important in the world — integrity, love and happiness. What else can I say about money? Strive for it, fight for it and use fair means. Love, but don’t love for it.Everybody comments on what s/he doesn’t have. Today, I have far better things in life than money, but not health. God has given me everything — wealth, success, a good wife and good friends. I wish He gives me good health. I would like to conclude by saying: Never forget that money is the means to the world, but not the end of it.Have balls of steel, dream big with your heads held high and feet firm on the ground. Failures are inevitable, but learn to take defeat with a smile. These are wise words. It is great reading your posts again, and I love how you highlight the important points made. It is good to be the master of money than the slave of money. I also view trade and business like a game, which makes for the fun and challenge of wealth creation. To me wealth building is more of professional sport than a game.There is still the keen enjoyment but the fun is subdued.I guess it’s because I am hungrier.I wonder if I will ever loosen up enough to play for fun?I suppose time will tell.,,,In the mean time I am using happiness as a gauge to decide if I am taking a wrong turn. I have noted the many posts in my e-mail, all which I will read soon. All your posts are welcomed.